Oh, I do not like the hybrids...I prefer the true species...how come you keeping hybrids... I constantly hear of this. Yes I like the hybvrids, of coursely I do! Who doens´t? But...but not just them and why? Those who think that keeping a plant in your garden is saving the plant as species is wrong. species is preserved in reserves well in its havitat or within its range. 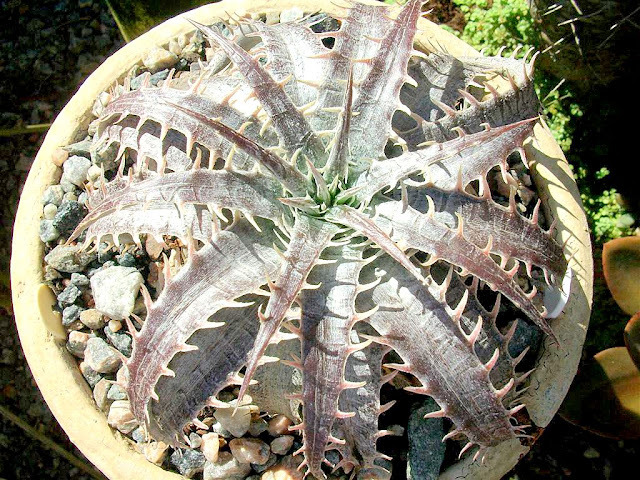 Once a Dyckia is in any´s garden it is questionable! No one would be wise enoug to bet his or her neck on the assureness oaf determined species. Dyckia change and chage a lot. Dyckia have many looks and most are shown in different conditions and culturing. If one keep a Dyckia species thinking on repopulating the habitat forget it! It is a crime to remove a Dyckia from its habita and there are specific laws on that and international agreements were made to help to prevent this to happen. 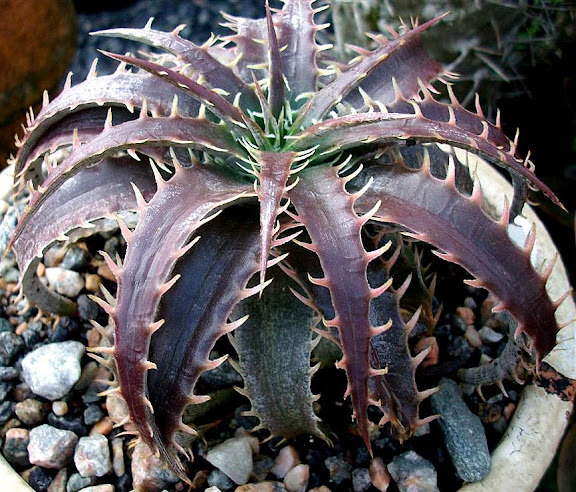 A much worst crime would be to introduce a new genetic material in a Dyckia habitat. This would cuase a terrific devastation. This is the death line for any species. Dyckias are preserved where they are or at least within their range. some populations were are moved when some areas are flooded to make energy disposable to us. Reserves and education is the oly way for preserving!!!!! All the rest fantasy, fantastica fantasy. Even a Botanic garden is not trustable enoug for being alowed to reintroduce its plant in nature. Also science uses a big necklace made with the botnatic pearls tht were made along the time. Hybrids described as species, Species that never existed anywhere even in gardens were described as species. Unfertile plants are accdepted as species. Plants no one can find are said to be species named and even the author can´t tell us precisely where it lives. So this is just a tiny part of everything or the whole thing. I just wonder what future will show us. Keeping species in a gardem full of many other species is just maddness to even imagine getting a plant or seeds from this or such place and putting them back in nature. That would be a very infame crime! I do love hybrids! They are better looking. Promptely adapt to cultivation....and better yet: they do help the preservation of the true species in habitat. Here we do not bothe to climg the rock to pick up a Laelia purpurata one of the world most beautiful orchids. We have it in most pristine condition in any florist or garden center. They are much cheaper than wating your time and money on going to the bushes in search ao a Laelia purpurata. They hang on street tress here well percher there magestically perched there. Noone bother to pick it from the branch. Cacti are so. We have prettiest in the garden center and much better looking. Bromeliadas are so. We do not risk our neck to get a Vriesis ou Neoregelia or Tillandsia from the trees...in the garden Center they are better looking and much safer.